As recent wildfires, storms, and other extreme weather events have shown, the climate crisis is only getting worse. Everyday we see attacks from the Trump administration on communities of color, the environment, and climate science. Now more than ever, California needs bold, transformative action and real climate leadership, starting with our Governor, to stop bowing to industry pressure to enact bad deals like Proposition 70, and other policies that undermine our climate action and hurt our communities. 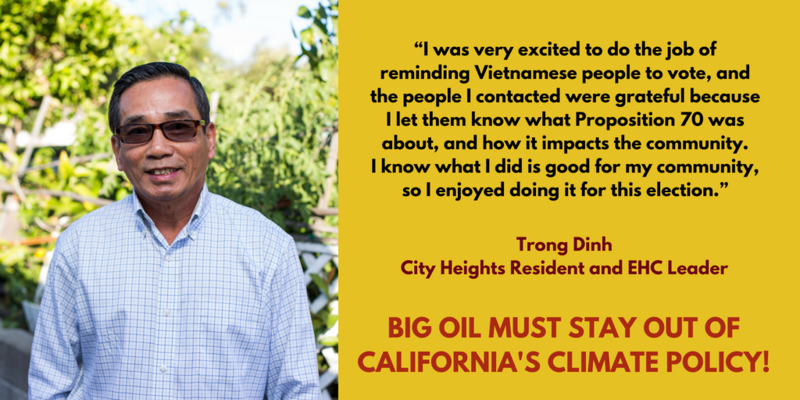 On June 5th, voters in California resoundingly rejected Proposition 70, the most controversial proposition on the June primary ballot, that was part of a long-term effort by Big Oil to attack and undermine efforts to address climate change. The toxic measure would have seized climate funds that are protecting health and cleaning the air in communities on the frontlines of the climate crisis. That’s why communities of color rose up to lead the fight against Proposition 70 — and we won, with 63% of Californians voting no. The Proposition lost in every singly county in the state, reflecting voters’ healthy disdain for ballot initiatives born from industry-backed deals. In voting no to Proposition 70, Californians said no to political compromises brokered by politicians that are bad for the climate and our communities. Coming off of this win at the ballot box, our fight for climate justice continues: our climate policies still have major loopholes for corporate polluters that lead to increased emissions in our communities, and we have yet to see action from Governor Brown to stop the ongoing expansion of fossil fuel extraction. 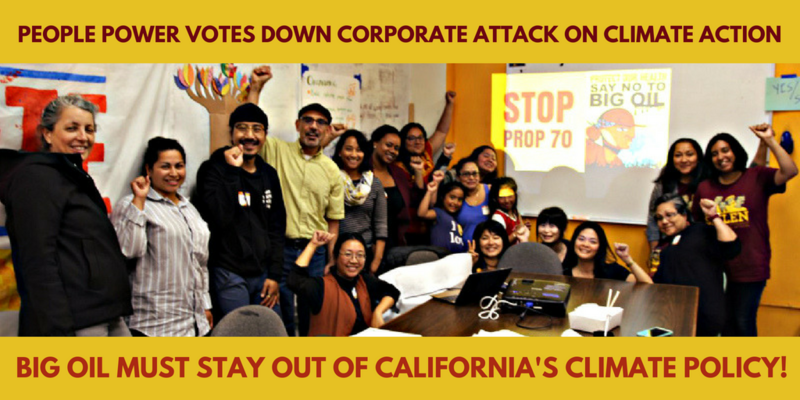 CEJA Action and our members celebrate this win for California, the health of our communities, and for climate justice. We are building our power at the ballot box, in the legislature — and in the streets. On September 8th we will join thousands of Californians to Rise for Climate, Jobs, and Justice, a mass mobilization to demand real climate leadership and solutions that put communities and the planet — not Big Oil — first. CEJA Action has what Big Oil and corporate polluters don’t — the power of tens of thousands of residents who care about our health, our future, and our climate. Together, we demonstrated that we will not let our communities or our state’s climate policy be held hostage by Big Oil. By requiring a supermajority vote to approve climate spending starting 2024, Prop 70 would have led to budget gridlock and increased the power of corporate interests in our climate policy. A supermajority makes it nearly impossible to vote on anything in California’s legislature. A two-thirds vote on California’s climate budget would inevitably lead to trading political favors with conservative legislators already backed by Big Oil and other industry interests, at the expense of climate action and investments. The campaign to Stop Prop 70 was led by communities of color on the frontlines of pollution and united community groups, environmental organizations, and labor unions. 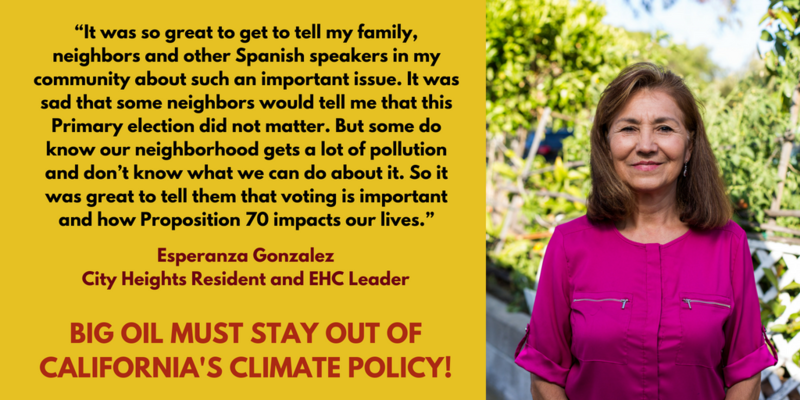 EJ communities across the state mobilized their family, friends, and neighbors to vote down Proposition 70 because we needed to take a stand against corporate-controlled climate policy. The health and future of our communities was on the line, and we knew that Proposition 70 would have been disastrous to long-term climate action in California. CEJA Action members CAUSE Action Fund, CBE Action, CCAEJ Action, and Environmental Health and Justice Campaign ran dynamic field campaigns to mobilize their communities to vote no on Proposition 70. Over 50 organizations across the state opposed the measure, including the Democratic Party, the California Labor Federation and several other major unions. Almost every major media outlet in the state editorialized against the initiative. A majority of progressive electoral groups included oppose positions in their voter guides, from California Calls to AAPIs for Civic Engagement to local tables. Our campaign lifted up the voice of frontline communities through social media and videos in English and Spanish, featuring residents in Southeast LA. Proposition 70 was part of a long-term effort by corporate polluters to attack efforts to address climate change, and it would have undermined climate funds to protect our health and fight climate change, setting a dangerous precedent for industry-negotiated climate policy. Last year alone, the top three Big Oil lobbyists spent more than $17.6 million to weaken California climate action, including putting Proposition 70 on the ballot. The measure was only on the ballot because of a deal brokered by Governor Brown in 2017 with industry and Republicans to garner bipartisan support for the cap and trade extension. The deal enacted a program riddled with loopholes for polluters. These loopholes already lead to increased pollution in our communities, and the oil industry continues to lobby at our regulatory agencies to make it even weaker. We could not allow these same corporate interests have a shot at diverting or preventing climate investments from getting into our communities. Proposition 70 threatened all Californians, but would have impacted communities of color first and worst. It threatened years of hard work from communities of color to direct climate investments to improve health and fight climate change. These programs have built affordable housing, created good local green jobs, installed solar power, replaced highly polluting cars and trucks with clean electric vehicles, and planted trees and transformed formerly toxic brownsites to parks and community green spaces in low-income communities and communities of color that need them the most. The victory against Proposition 70 declares that Californians care about protecting our health and fighting climate change. We demonstrated through our voices and our votes that we cannot be ignored, and we are growing our political leadership for climate, health, and the future of California. Our fight for climate justice continues beyond this vote — See you in San Francisco! The defeat of Proposition 70 sent a strong message to decision makers that voters will not accept policies written for the benefit of industry — it’s a win for all of California, the health of our communities, and for climate justice. We will continue building the political power of people of color living and working on the frontlines of pollution. CEJA members and community groups across the state are advancing real solutions to the climate crisis, starting with the most impacted communities. Environmental justice communities are fighting for real climate solutions every day, borne out of their daily struggles and a vision for a just, sustainable world. We demand to see more bold and transformative leadership from the Governor and the legislature in these last months in office — particularly in this era of Trump — and there are plenty of opportunities to fight back and enact change. This September, all eyes will turn to San Francisco for a week of climate mobilizations in the lead up to the Global Climate Action Summit. Communities of color living and working on the frontlines of the climate crisis will continue to rise against deceptive policies like Proposition 70 and push on a national stage for community-led solutions to reduce pollution, protect our health and the planet, create equitable good green jobs, and build real climate leadership for California.